In a book entitled Hiwar Shahafiy Ma'a Jinni Muslim written by a Saudi Arabian spiritual expert Muhammad Isa Daud. With the mediation of the human body, he has managed to have conversations with the Jin who is an Islamic, and perpetuate it in a book. In the conversation he tried to extract information from him in the form of great mysteries among humans, one of which was about the lies that had been successfully implanted by the ghost in the heart of mankind that the spirit of the dead sometimes hung in the world (against the notion of 'the day of grave vengeance' '). The other, which will be discussed here is to uncover the mystery of whether / who actually UFOs (Unidentified Flying Objects) are considered extraterrestrials coming to earth. Whereas until now there is no definite theory from experts that there are indeed planets in the universe that are inhabited by creatures other than humans. Even this has become one of the special projects of the FBI, CIA, and NASA, which until now the results are still in the form of assumptions and only temporary theories about who the UFO creatures really are. It will also be explained from him about whether the mystery is stored in the Bermuda Triangle region which has removed several ships and planes. Until now the area has become a scourge among humans to pass it. The Muslim Genie who was in dialogue with the author came from Bombay, India. Previously he was a member of another religion. 180 years old according to his confession. According to him after he converted to Islam, there were also around ten thousand Jin, who were his bodyguards and companions. Jin is a great leader, has influence and authority among him, in Bombay. With the effort that spends a lot of energy, time and cost, the author finally managed to invite him through the body of a man finally had a conversation with him that was successfully recorded and enshrined in a book. Are there Devil in this Age? We all know who the creatures that caused our ancestors Prophet Adam AS and his wife Eve were expelled from heaven by Allah SWT. It is entirely new to this world, with Allah's permission, containing many surprising new discoveries, as well as answers to various problems that have puzzled world scholars and scholars, even though it is very difficult to subdue it in scientific research. But all of that is the mere truth, and the truth is what the writer wants to offer to the Islamic world in particular and the world of mankind as a whole, more specifically to researchers who want to find answers to these puzzling problems. With this, the authors hope that they will be free from confusion and no longer spend millions of dollars. Just to take photos via satellite and destroy places full of mystery. Nobody should be among the readers who think that the author offers this scientific gift easily. Because even the author has spent considerable funds, as much as can be provided to bring Muslim Jin who always distance themselves from me during his hiding period. The author also had to sweat and brain in my various discussions with him, because he was not willing to fulfill my invitation. He was truly afraid of the attempt to assassinate him by the devil and his followers. Therefore, sometimes he pretends to fall asleep, as a strategy to avoid being surrounded by his enemies. Finally, my belief and trust in God were also the ones who could convince him to meet me. I also have to teach him the faith, while affirming that anyone who is afraid of Allah, then Allah will make everything afraid of him. While people who are not afraid of Allah, Allah will make himself afraid of everything. I also convinced him that Satan's guile had no meaning in his ratio with a Muslim who believed in Allah, both Jinn and human. A: "Once, once when I was a child, and several times when I was a teenager and before I converted to Islam." P: "Why are you facing Satan, even though at that time you were a kid?" A: "I didn't go to see him on my own accord. But my father invited me to see him so that he (the Devil) would give me his blessing. " Q: "May Allah curse him, and praise is to Allah who has blessed you by entering Islam." P: "Tell me how it looks"
J: "The form is like a genie that I told you. But God gave a curse to him and to his descendants with a bad appearance, even though he could manifest in any form. He has a very short tail, about 4-6 cm or less. P: "Is the tail generally owned by all jinns, or only to devils and grandchildren only?" J: "Alhamdulillah, only the devil and his son and grandson have a tail like that. Looks like they are special beings. Whereas the genie doesn't have a tail at all as you imagine. The devil's tail is not along the tail of a cat or other animal, as it has been described by humans. " P: "How high is it? Is he really high, as is imagined while people have been, or is it mediocre? " J: "Compared to humans, the height is about one arm, Yes, about 140 to 160 cm. But he could manifest himself in a higher and bigger form, up to ten meters ... "
P: "Does he have a house or palace?" J: "A very large palace, with millions of servants, millions of bodyguards, and millions of demons, besides other palaces in many places. The same is true for the rulers who are placed in the various centers of their vast government. " P: "He also has a throne right?" J: "Yes, yes," he answered rather surprised. P: "You are a Muslim genie, O my brother, and a Muslim is only afraid of Allah. Against a Muslim, Satan did not find a way to disturb him, as long as he obeyed Allah. I think you are like that. " J: "Yes, that's right, thank God, I have succeeded memorize Al-Quran in four months. P: "Then why should you be afraid of the devil and his army? With God's protection, you are much stronger than them ... "
J: "Yes, yes, it's true. May Allah repay your kindness for teaching me something like this. Now I'm getting stronger and sure ... "
P: "One day, I read a history of the followers of Dhulqarnain, which I suspect is Macedonia and not what is mentioned in the Qur'an that once upon a time, on their way, they arrived in a place with a lot of water, and there was an island in the distance. They saw a people with a dog's head, their fangs coming out of their mouths, just a flame. The followers of Dhulqarnain immediately went out and attacked them. In the distance, they saw a very bright light, and it turned out that it was a palace made of Crystal. Dhulqarnain intended to conquer them and enter the palace. But Bahram, the Philosopher, forbade him and told him that whoever entered the palace would fall asleep in it and would never be able to come out again and be held captive by those in the palace. Some people have entered the palace whose contents are unknown to anyone. They then fell asleep, without ever waking up again. Isn't that the Devil's palace? " J: "Maybe, yes," he replied, "but maybe not." P: "What do you mean?" J: "The devil has many palaces, he moved from one palace to another to organize his very large kingdom. His biggest daughter also has a palace and a bodyguard. Whereas the male children have very large palaces, like those of government officials. That's where they control all their misdirection activities against humanity, in the aim of realizing the ideals of Satan they consider to be their God. " J: "I mean, yes, like you said that." P: "Exactly where?" I urged, He paused and tried to dodge. Once again I taught him the belief in God, after that, I launched my shot which I based on my various studies. Some of them I will present here, and some of them I will say later. P: "Isn't the army of demons and their incarnation in human form, as well as their figures, both from humans and jinns, who are responsible for the loss of planes and ships that enter the Bermuda Triangle, especially when the two verses mentioned by Muslim Jin that (Arrahman 18-20) asserts that what is meant is barzakh which separates the two seas that meet. The reason for that is the word of Allah SWT which was stated directly after the two verses, namely from both the pearls and the Marjan came out (Arrahman: 22) We know that the Pearl and Marjan are only out of the sea, and not the river. Dozens of airplanes and ships were declared missing in the Bermuda Triangle without the sight of the jungle for several years. Most of the missing aircraft are certain types of small aircraft. (A few years ago world magician David Copperfield had succeeded in revealing a lost ship in the area, but was subsequently eliminated.) Although the planes were lost in an accident, they did not disappear. In the case of the disappearance of the aircraft, there were Human Error indicators, engine damage, bad weather, poor pilots and skippers. Meanwhile, the disappearance of small planes in such a large area is something that is only natural. From the recordings of successful conversations, there are still important things that are still mysterious, which are then examined carefully but with unclear results. The Star Tiger aircraft, for no apparent reason and without sending any signals, suddenly disappeared on January 30, 1948, on its way to Bermuda with 31 passengers. The pilot has confirmed that they will soon land normally at the destination. Meanwhile, on December 28, 1948, a DC-3 aircraft with 35 passengers flew from Puerto Rico and informed him that he was at a distance of 80 km south of Miami, and after that, it disappeared was certainly not the jungle. On January 17, 1949, the Star Areal aircraft that were of the same type as the Star Tiger plane were heading to their original place of departure in Bermuda. The aircraft captain informed us that the weather was very good, and he would soon arrive in Jamaica soon. Unfortunately, the goal was not achieved, and he just disappeared. Perhaps more interesting than the disappearance of the planes was the survival of a ship, but it was very far from its original purpose. Mary Silhouette, the name of the ship, was discovered in December 1972 floating in an empty state. The passengers consisted of a priest with his wife and a child, along with 8 crew members. Everything disappears without a trace. The pilots and the captain are people who don't have a "fortress" in the face of a demon attack? Even if they survived it was very rare and only an exception. Isn't Satan often pretending to be a survivor just to keep people off guard from their threats? To the extent that some of them consider that their ship or plane is being sucked by a tornado. This case is seen as the case that attracted the most attention, especially because the ship was found without communication equipment and rescue equipment. The route he took was New York-Geneva. The last position that was captured before he disappeared was 2 km west of Azore Island. But when Mary Silhouette was discovered, she was near Portugal, not around Bermuda. Although there are many theories put forward by people to interpret this case, yet no one can uncover this mystery. Another case that was noted was the incident experienced by Carol Darling's ship. This ship approached the coast of North Carolina in January 1921, without any passengers except 2 cats. While the 12 crew disappeared without a trace. Likewise all the rescue equipment. No one can explain well why the crew left the ship just like that. All ship engines are still functioning properly, and other items are in the right place. What is very interesting about this event is that, on the ship, there is a dining table with food scraps that have not been removed. It seems something has happened suddenly. What's even stranger than that is the disappearance of the Houwitz Ship at the same time and place. The American government believes for several months that the two ships were attacked by pirates. Because obtained signs of unknown people entering the vessel. The government rests its assumption on information provided by other ships that had seen Carol Darling and saw someone with a redhead waving his hand at them. It is not known for sure whether the person is a crew member or not. The foreign ship passengers also informed that they had seen another ship near the Darling carol position. But they did not know for sure whether the ship was Houwitz or not. Another very interesting Bermuda Triangle event was the loss of Skylab in March 1917, in conditions that were truly mysterious. Newspapers reported that maritime experts did not believe that the largest ship in the ranks of the American fleet could simply disappear. From the mysterious phenomenon of the Bermuda Triangle appears various imaginary stories. As with the events experienced by the ships that have been described previously, then the images given by people about the Bermuda Triangle are truly mysterious. An example of that is a later event. That is the event that occurred on the afternoon of February 27, 1935, when the hotel occupants at the Daytona beach and those who were basking on the beach were startled by an airplane flying low above them, and suddenly swooped into the sea. Divers from SAR teams were deployed, but they found nothing. However, the people who were there confirmed that they really watched the plane that crashed into the sea. However, tracking still shows no sign of a plane crash. The Muslim Jin of my best friend was silent. From the look on his face, I could catch that he was swaying between agreeing and doubting my opinion. Then he said, "Once upon a time, I will tell you more than that ..."
P: "No, but I'm the one who will reveal to the world, God willing, the mystery of the Bermuda Triangle is full of mystery. You know that I know a lot about it. " J: "The problem is exactly what you said." P: "Actually the event that happened to the 194th expedition, following the subsequent expeditions, which had dismantled the existence of a more astounding triangle was the effort made by experts in solving the mystery by proposing various imaginary interpretations, to the extent that some of them said that the Bermuda Triangle is an electromagnetic region. Such a view interprets these events as a repeat of the reappearance of events that have occurred in the region due to the time tunnel (Time Tunnel). That is, in the region, there is a radius that can repeat events that occurred in the past. Or in Bermuda, there is a place where there will be a change of place and time. Airplanes and ships, along with passengers still alive, but at other times and places. Such views were also raised by experts, and the most famous was Ivan Sanderson. In this region called the Bermuda Triangle, which for later periods was dubbed the Atlantic Graveyard, there was an awkwardly horrifying story, which was the catastrophe that befell the expedition carried out by the 19th American Squadron, which was not for the event, Triangle Bermuda will certainly not be famous throughout the world and will not be a special FBI and CIA investigation project. "Here is Lieutenant Charles Tylor, Commander of the 19th expedition, can you be arrested ...? Please answer ... We lost the instructions to return ... we got lost ... I can't see the land! even the region where I am now I barely know ... it seems ... it seems ... "
"I don't know where I am. Looks like I got lost Can I be heard? Please answer…"
again the connection is lost. Commander Wersink immediately deployed the SAR Team under his command, nd ordered that he immediately rescue the 19th expedition. At full speed, the AL fighter departed with 13 personnel who were very experienced in rescue tasks, to save the expedition. When the SAR team arrived at the destination, there was an event that was never expected. Bermuda, is not the expeditions that first experienced poor luck in this mysterious place. It can't be imagined by anyone. Because when they were at such critical moments, suddenly the SAR team disappeared behind a mysterious fog without leaving a trace, except for the silent sea, and it ended up there. "Here Lieutenant Charles Tylor ... Commander of the 19th Squadron Can be heard? Ask to be answered! Now I know where I am ... Finally I know where I am! I am at an altitude of not less than 2300 feet. But there is something unnatural, No, but what I see is impossible is something natural! Can you hear? Ask to be answered! Everything in front of me moves towards me and blocks me. I move by myself ... Can be heard? Ask to be answered! 100 miles speed. All compasses run as if controlled by something. Each shows a different direction Can be heard? Ask to be answered ... "
"Don't follow me ... As much as possible don't follow me ... Don't come near ..." In another message, the voice of Tylor said, "it's over ... don't approach us ... don't get close ... There is no point at all! They are immigrants from outer space! They ... They are inhabitants of other planets! That's what I saw ... I repeat ... Everything is over ... Can you hear it? Ask to be answered! It is all over!" 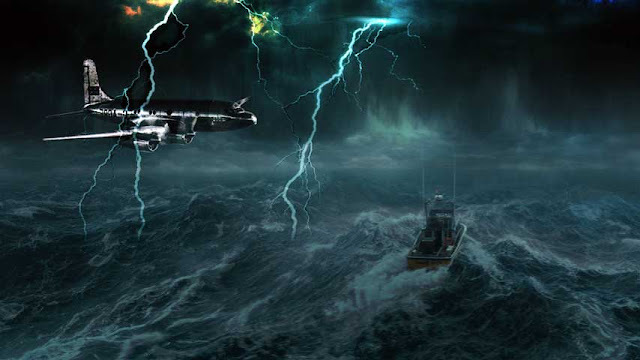 Vincent Cadys, a specialist in mysterious marine events, and at the same time the first person to use the Bermuda Triangle designation, said that this area (Bermuda Triangle) was a very dangerous area for shipping and aviation. This area was responsible for the loss of no less than 100 aircraft and ships, whose victims reached more than 1,000 people. Most of these mysterious events occurred in 1945. In all these events both aircraft and ships were completely gone without a trace and did not leave the victim as it did, for example, on a ship hit by a wave or a plane crash, which then showed a corpse dead bodies. When such an event occurs, it is strange that the sea in a state of calm and calm is very good. Meanwhile, Charles Berlins, author of the Bermuda Triangle, explained at length in his last book, Without a Trace, about the disappearance of planes and ships, which began on the French ship Rosalie that passed through this area in 1940. The engine was still good and the load was not disturbed. But the ship was empty (not a passenger or manned), and ended with the disappearance of a large cargo ship belonging to the United States. Anita, with a load of 20,000 tons, on March 23, 1973. Before that, it was also missing in 1972 in the region, a man named Hary Silatszcky. The same fate was experienced by a Dutch ship, Herminea, which was discovered by a beach guard who was sailing near the ship. Herminia sailed as if aimlessly near the south coast of England in 1949. This ship was found without a screen, which proved that it had been hit by a storm. But when the beach guard climbed on the ship, it turned out he didn't find a passenger. It seems that all passengers have left the sailing ship. The strange thing is that the ship has a float that is still neatly stored. However, there are no signs that this sailing ship has ever experienced interference. All items are neatly arranged in place but without passengers and crew. And many other mysterious things related to both the Bermuda Triangle mystery and extraterrestrials, which are sourced from hundreds of eyewitnesses. J: "Indeed, this problem has occurred for a long time, to the extent that fishermen are afraid to enter the area. What was most feared was that the people who researched the place would be arrested, when he dared to enter the area without permission. P: "Can this permit be obtained by burning incense?" J: "Some of them are buying and selling with Satan, and say," we take refuge in the rulers of this place from all kinds of perils. " Just like what people have done when they are going through the desert and places that are considered haunted. Or, ships and planes that pass through the region carry psychics who have an agreement with Satan. If not, then they will most likely catch the plane and the ship, along with their passengers, they will catch. Sometimes they just have to catch the passengers, to make them research material in the kingdom of Satan, or to be made victims to Satan who are very happy to see human death, especially if at the end of their lives they are not in Islam. The sacrifice is usually carried out on the great days of Satan. J: "The ships and planes are placed in a certain place, closed with certain rays until invisible, or surrounded by thousands of demons, exactly the magic that brings a soldier who suddenly throws it in front of you, and you will not be able to see it before they leave that place." P: "I know that you don't want to convey that to me in full." P: "I will not tell you what I know. But I will convey to the world my discoveries that have cost over 10,000 dollars. " I asked him, "What do you think of people who say there are light ships that often appear in the ocean, and he was involved in the" hijacking "of the missing ships?" P: "They say that there are extraterrestrials, and they are the ones who carry out these harmful actions, in the sense that the Bermuda Triangle is the center of research for intelligent creatures from other planets. What do you think about that? " J: "No, not them. Because even though I have traveled more than a hundred times to various parts of space, I have never seen extraterrestrials. Whereas the Bermuda Triangle, some of the secrets I have told you. " P: "So, you do have more information than you say to me, right?" J: "Of course, but it's a secret." P: "Is it also a secret for me, after we have made an agreement so far? If so, let's do a friendship agreement in the name of God. " J: "I swear in the name of Allah the Highest, that I truly like you based on the religion of Allah. I have never been in a human home for so long like I was in your house now. P: "I also like you in the love that God wants." Intelligent Beings Apart from Jinn, Humans, and Angels I say to Muslim Jin, "But somehow I am sure of the existence of other intelligent beings besides humans, jinns and angels. But they are on another planet that is not our planet earth. " P: "The rational argument that is in my mind, and the Al-Quran's argument that I know about." J: "Try, teach me what God has taught you." J: "Do you think this earth is also seven?" P: "From the affirmation of the verse, that is so." J: "Are there any creatures like us?" P: "Is it like that it is difficult for Allah to create it, whereas Allah SWT has said, Verily His business is, if Allah wants something, then be it. There are also rational arguments. " P: "Doesn't it make sense that an architect who built the 102-storey Empire Building, which he said was the tallest building in the world, could only build one building?" Lord of the wind and its gusts, we plead with you the goodness of this village and the kindness of its inhabitants, we take refuge in you from its evil, the evil of its inhabitants, the evil of everything in it. It is a proposition that the seven earths are inhabited by something we do not know. Allah knows best about all this. J: "Is there any evidence of this advanced communication with the people of planet Earth?" P: "Good, I said," I will tell you, O Mustafa, (the genie claimed that) about some of their features and images so that you can express your opinion to me. " J: "Well, God willing, I will express my opinion in truth," he said. Then I told him that, one of the Americans who had seen a seven-legged foreign object, once saw a crowd of people or creatures similar to humans, in their garden. They hid among the vines that were there. Angry, the American watched over people who arbitrarily stole the produce of his garden. He can't hold back. He immediately came out of his house and headed toward people he thought were ordinary thieves. However, when Mash, according to the name of the man, was about 10 m away from the thieves, suddenly one of the thieves faced him and aimed at a weapon in his right hand. Then put the weapon in the sheath which hung on his left waist. Mash felt his entire body weak, he could not move his head or other limbs. He can't feel something forever. After the incident, and after being able to answer some questions. Mash said that the creatures were short about 160 cm in height. His head was very large and not comparable to his small and short body. Their heads were attached to their shoulders, without a neck. Mash also said that the creatures had hair. His mouth seemed to be a gaping hole, and his eyes resembled human eyes but were not pierced. The skin is light in color, resembling the skin of a central European population. His shoulders were slightly wider than his head. Mash saw that two creatures that were nearby had two hands and feet. But he did not have time to see his hands and feet. The two unknown creatures wore damp clothing, without a connection, and tightly printed their entire bodies. The right side of the two creatures hung on their arms, while on their left side hung a large backpack. "The two unknown creatures returned to their plane, which was about 2.50 m high. They kept looking at him from the cockpit of their plane, which seemed to be made of glass-like material. The aircraft door is then closed, from the bottom up. So that their legs become invisible. The plane took off with a very dazzling light. Then without the slightest sound, go upstairs. When it had risen by about 30 meters, suddenly the plane disappeared from view, as if a ray suddenly went out. " J: "I swear to you in the name of Allah, that they are Jinn. However, usually, they appear in a higher and bigger figure than their real figure. P: "Where do they come from you think?" J: "I don't know, but maybe they are the occupants of the Lightroom that is between red light and clouds. Or, people who come from the bottom of the ocean. " P: "You have to see the original copy of the letter sent by the genie named Aksea and these stamps." By just looking at the stamp on the letter I showed, my best friend's eyes shone; then shouted, "This is indeed Jin's stamp." P: "What do you think?" J: "I've seen this stamp a number of times, and also this type. I can tell you easily that this stamp is a sign of a genie or a human. In short, I say that this is an act that has been linked to humans. The Omo people are residents of the Jin country who are Christians. The stamp they put here is a cross with several bars. More than that, their nature is the nature of genie, and their aroma smells of genie. But unfortunately, their food is like devil food. Which brings them at a speed that is truly unbelievable. In addition, they also have long and big hands at once. Then I also told him, "Would you like to see some of the paintings I made based on the information conveyed by an Englishman named John, who told me about the dragging himself (by a genie) before the same event that was experienced by a group of people unprecedented. The records are obtained through Hypnosis. Then, after I handed him a few pictures, he suddenly smiled, then said, "Don't you notice the faces of both of them. He really is similar to the real genie. Also pay attention to the horn that you once asked me. " P: "Yes, yes it's true. But how do you think about the two images that resemble the shadow of human light? " J: "If this is true, then both are jinns when they appear in other forms, or they are in their original form, but hidden behind the clothes. Both of them move with the clothes covered. " P: "Can they do this easily?" J: "Of course it's easy, even easier than appearing in human form and moving with their bodies without a veil. If I, for example, show myself in the figure that I now use before you, then I weigh around 115 kg, and I can still move lightly and easily. So, is it difficult for me to wear clothes that only weigh up to 20 kg? It is clear that the western world cannot understand the extent to which Allah has bestowed upon us the ability to manifest themselves in various forms. " P: "Indeed, to the extent that in an event they told, they said that one of them had seen a very strange bird-shaped woman. He was blond, but suddenly his hair turned black. Instead, they assume that the creature has painted their hair in a very short time, they even assume that the second woman is another woman with the same face or her twin brother. Though actually both of them are the same woman. He is a female genie who has the ability to change form. Then I said, "Will you listen to the story of the captive Antonio da Silva, and see the picture that confirms that the captives were from the genie. Yes, just to increase your confidence. " P: "This Brazilian young man went fishing, but apparently he disappeared for weeks. Suddenly he reappears with a story about how he was captured by three dwarf creatures. Two of them wore hard clothing as if they were made of metal. While the third being is slightly higher than the two. Approximately 1.25 meters high. He did not wear metal clothing as worn by two other creatures. When they arrived at their residence, the young man knew that the third creature was their leader, the Brazilian Youth saw a large bulge in the head of the third creature. The leader has long hair with red color. End up to his appropriateness. He also saw the waving of his chest which stretched to the white. The two fingers thick eyebrows almost covered his entire forehead. The skin is relatively bright, round-eyed, but larger in size than the human eye. White eyes look cleaner than white human eyes. His eyes always blink. Antonio did not see the edge of his eyes. The rest of his body was almost covered in thick fur. His nose looks long and pointed, looks sticky and very different from the human nose in general. His ears are really symmetrical, the bottom is like a human ear, but the upper part is more rounded. The mouth is smaller than the human mouth, similar to the fish's mouth7. When they talked to each other, the Brazilian youth did not see any teeth in their mouths. The important thing to remember about this story is that his human-like figure had made the Brazilian youth not too afraid. After that Antonio didn't remember anything and they took him somewhere, somewhere ... "
The Muslim Jin affirmed definitively about all the features, and confirmed that this was the characteristic of the genie, even though he did not see the picture. Convincingly the Muslim Jin said, "There is no doubt that he has teeth, but his shape is long and pointed upwards compared to human teeth." "I swear to you, O my brother, that he is a genie. Could there be a genie not knowing his own people and nation? Even all the events you told me earlier were events engineered by genies. All characters match their characteristics. However, there is still something you have never mentioned. This is about the motion of the creature. Because the Jin movement, really, is very fast for human size. " I cut the story by saying, "There was another incident they called the Palvidares case, which was perpetuated by Fabio Therba in his scientific book entitled UFO and The Secrets. There, among others, was told that there was a Latin American named Carlos Palvidares who lived in Buenos Aires. One day Palvidares left for a plantation. Suddenly he saw three figures moving above the lake water near the hut that was in the place, without moving the water itself. As if they were creatures that hung in the air. Palvidares approaches them to a distance of about 80 m. It turned out that the three creatures consisted of two men and one woman. Palvideres called out to them, so the three creatures turned towards him, and immediately hid in another part of the lake. They moved away for about 300m. Palvidares was really surprised because he did not understand how they moved so fast. The woman was about 160 cm tall and dressed in black. His black hair looked long when he moved. At the bottom of the calf, there is a pair of fins that point sideways, like wings. Whereas men, both are slightly shorter than women. Palvidares was able to confirm this when the three of them stood side by side. Both men have a height that is truly the same. Both seemed to be naked. Their skin resembles human skin sunburned. It turned out that the two men were not naked, but wore some kind of tight clothing that did not have a connection. Both were brown-haired, and clung to the scalp in such a way as if they were attached with glue. It turns out their skin is white. Wide forehead and small eyes. They walk without moving their hands and feet. It is as if their limbs are fixed on their bodies. When Palvidares saw them for the umpteenth time, he saw an electric vehicle, with a very bright light. The vehicle is 5 x 6 meters in size; with a height of between 2 and 3 meters. The vehicle emits bright light with a radius of about 40 meters, similar to the light coming out of a projector in a movie theater. The light hit Palvidares's face, and he felt his eyes become blind. The heat emitted by the light makes Palvidares discouraged from approaching them. He went down into the water and tried to approach the alien to a distance of about 150 m.
But he could not be closer, because suddenly an invisible wall blocked his movement from the front. The invisible obstacle continued to urge him, however, he tried to fight it the vehicle continued to follow their motion at a distance of 30 or 40 meters. Brands constantly move from one place to another. The woman seems to be their leader, and she is always in front. Once upon a time, when he raised his hand and pointed towards the electric vehicle, then one of the two male beings who approached the vehicle immediately moved away from him a distance of 30 m. After that, the three aliens moved away quickly, as if forming three lines on the ground. They change themselves in another form that is not very clear in Palvidares's view. But he could see the presence of a screeching pig, who was somersaulted by a creature with a speed that was hard to imagine. Immediately after that, Palvidares smelled fragrant. Not long after, he felt sleepy and limp for a long time. When his condition recovered, he no longer saw aliens and luminous objects that had attracted his attention for more than an hour and a half. Since that incident, pigs and some cattle that have fled from their cages due to the strikes of unidentified flying objects, do not want to return to their cages, even though Palvidarest has searched for them here and there. " The Muslim Jinn of my friend smiled, then said, "What is your comment on the incident?" P: "Of course they are genies," I replied, "The speed of moving like that, only they can do it. About the invisible veil that blocked Palvidares from approaching, I thought it was just fear that made her unable to move. A fragrant smell, is a smell that is common in genies. Whereas pigs and other animals that can see their true form, do not want to go back to their cages, because they know that friends of aliens are now living in their cages. Small children who are one to two years old, can see the genie in their original form, as stated by the Messenger of Allah in one of his hadith which reads, "If you hear the donation of donkeys, ask for protection from Allah from the devastation. Because the donkey has seen Satan. And if you hear the crowing of a rooster, then ask Allah for His grace, because the rooster is looking at angels. " J: "Now you know in full. Therefore, reveal the truth that you know throughout the world so that there is no more darkness caused by the tricks of the jinn and the form because of false assumptions. P: "I really wonder why western scholars cannot understand that around them are genies and demons, while one of them, Salvador Frexido of Puerto Rico, clearly recognizes it. In his book entitled Satan's Mind (in Indonesian), he said, the fragrant smell that was scattered in the place of the descent of unknown creatures, did not prove anything except that these creatures were demons. We can express this in other words, that in many cases the coming of Satan to a place, his arrival could not be done except in an unknown creature, besides his ability to manifest himself in human form. " "I want to convey to you a very important news. America, England and Germany intend to uncover the secrets of the Bermuda Triangle. They made new satellites that specifically monitor this area, besides the satellites of my child, Ronda, who is one year and three months old, can see my friend's Muslim Jinn in its essential form. He shouted, "He looks, here is Habib ..."
in an unclear baby accent. Al Bukhari and Muslim narrated in their respective Sahih. From Jabir r.a as narrated by Abu Dawud, Jabir said that the Messenger of Allāh berkata said, "If all of you hear the howls of dogs and donkeys in the night, then seek protection from Allah. Because they see something you don't see. " What they had broken before.11 It turned out that they had found nothing. Try to tell them they should not be too indifferent to their ambitions. Because the country there will never be seen and is very old at age. It is not possible for you to dismantle the secret. But they will not harm you, as long as you submit to God. " J: "Is that an area that is a hidden whirlpool?" The American Institute of Meteorology and Geophysics has produced a satellite to reveal the mystery of Bermuda and monitor certain places on the face of the earth. But once upon a time, all of a sudden and surprisingly the messages and voices that were captured while passing in the Bermuda area were interrupted. Professor Wyne Mitchgeon was assigned to investigate the incident. The results of his research concluded that "We are talking about a power that is very large and without limits, and we do not know at all about that." Although the satellite still sends images about clouds and soil layers, through infrared rays, the images sent are caught in parts earth facing. The first in Alaska and the second in Virginia. All messages sent are not interrupted except when satellite monitoring crosses the Bermuda area. The monitor screen only shows a wide field that is empty and quiet. But more important than that is that the satellite sent a very strange picture, and that happened when he crossed the Bermuda region. The monitor screen shows a vast land located right in the Bermuda Triangle. This is of course very surprising. It is very improbable that in the oceans and empty areas like that detected vast land. Along with the emergence of data on the monitor screen, an expert team was immediately formed to research the land located in Bermuda. Unfortunately, in the region, they did not find anything except strong winds and waves. Even more surprising is that, in 1966, the American navy conducted a survey of the Bermuda area. For this reason, a very sophisticated sound and image detector were deployed towards Bermuda. It turned out that what was caught by this sophisticated equipment was only a frenzied and unknown sound, which had absolutely nothing to do with the sounds on the bottom of the sea that was once known to humans. Finally, they knew that they were dealing with unknown aliens besides the Creator. After all, this research had shocked the world. Formosa is the name for an island located 145 km east of the Chinese mainland, which is separated by a strait called Formosa. Formosa is a Nationalist Chinese better known as Taiwan. The area of the island is around 35,961 km2 with the capital city of Taipei. 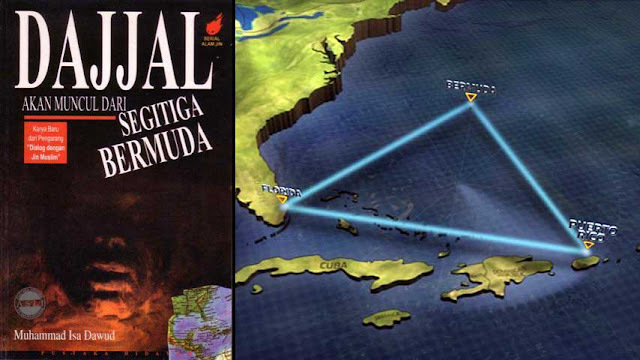 Formosa is famous for its position which lies in the direction of a triangle known as 'Satan's Well', in which events occur involving the loss of ships and planes that are no less mysterious than the events that occurred in the Bermuda Triangle. The top of the Formosa triangle is located on the island of Gilbert in the yellow sea. This area is called the 'Ship and Aircraft Grave'. The northeast corner is located on Wake Island, while the corner is located on the island of Formosa. P: "Yes, scientific evidence shows that the area is a meeting between the flow of warm water and cold water." J: "All places which are the meeting of two seas, namely the meeting between the flow of warm water and cold water, are the regions that Satan and his assistants have chosen as the center of the burial of the kingdom and the country ..."
I do not know, why did it come to my mind a hadith of the Messenger of Allah (saw) so I told him. These images themselves are compatible with what is called the Satan Sea, which is a quiet sea region, 800 miles southeast of Japan, located between Ivojima and Markus, but less so than the Bermuda Triangle, perhaps because of its location far from land. Japan. Meanwhile, the Bermuda Triangle is very agile for American sailors, who in turn swallowed many ships and planes. Nevertheless, the Demon Sea near the Japanese mainland was also responsible for the loss of several ships and planes. Between 1950 and 1954, there were no fewer than 9 large ships left in this area without leaving marks. The Japanese government was very concerned about this area and announced that it was a dangerous area and should not be approached. In 1955 the Japanese government sent an expedition by bringing a number of experts to the area using the Kawamaru ship. Unfortunately, Kawamaru disappeared without a message. An American scholar, Ivan Sanderson, who was very interested in all these strangeness, tried to see the location of the Bermuda Triangle and the Demon Sea on the map. It turned out that he saw that the two regions were located exactly in a long line between 30 and 40 degrees north of the equator. The area is almost the same. Through this conclusion Sanderson continued his observations on other matters, and he found that there were 12 regions in the world that were similar to that. Two of them are in the north pole and south pole, while the other ten are divided into two rows, the first rank lies in the longitude 40 degrees north, and the second rank lies in the longitude 40 degrees south of the equator. Each place is about 72 degrees apart at latitude. These places in addition to the north and south poles, among others, are two areas located in the land. One in the Great African Desert, and one in the mountainous region of northwestern India. Sanderson observes that most of these areas have similarities with each other, among others, in a location that is in a region which meets hot and cold currents, and that the place is seen as a point-node, because it directs the flow of water up and down in the direction opposite, and with these different temperatures, can generate magnetic waves which become the culprit for all the accidents. However, Sanderson's theory is not built on a proposition. There is nothing that proves that all two streams of water that are in opposite directions and with different temperatures can produce magnetic waves in the earth. In addition, Sanderson's theory also did not interpret the workings of the "Devil's Grave" located on the ground. Namely, two north and south poles, the third north of the Great African Desert, and the fourth in the mountains of southwestern India. Furthermore, the theory failed to answer the question, why were the passengers who were victims in such places abandoned the passengers just like that, and where did they go? Then, what events seem to be so frightening to them, so they leave their ships? P: "Is there anything to do with the meaning intended by the Prophet Muhammad SAW when he forbade someone to sit between a hot and shady place. He said "that is the seat of other creatures", or is it just an additional interpretation of the prophet's instructions? "Yes, including things like that, or at least close to that. Because Satan himself really likes positions that lie between two opposing things. The seat that gets Satan's priority the most is in the midst of the shade and the place that is exposed to the sun, or the half is in a hot place and the other half is in a cold place. " P: "Why should I choose things that are contradictory like that?" J: "You, humanity, will not be able to understand it. So it's enough if I say that such a place gives power to Satan. " P: "Are all jinns also sitting in places like that"? J: "No, only the demon group did it. Satan's descendants are indeed different from Jin, even in terms of sitting through. " P: "Are the Devil's palaces numbering twelve?" J: "I don't know, what is clear is that his territory is very broad. May Allah protect us from him and from his troops and from his disturbances. P: "In this context my brother, I once saw an American sorcerer named David Copperfield on a television show, and he could do some miracles that would not technically be manipulated in any way, such as removing the statue of Liberty NY, splitting in the room is open (not on the stage) to make children who watch screaming, can appear in other states in just seconds, fly flying in the air in the open space, to some action held in the Bermuda Triangle itself and many more that is impossible ". I say while playing a video recording some of his magic actions. J: As if understanding what I mean, my best friend's muslin then pointed to the television set in my house, then said, "Is this young man the one you mean, and that he can be free of various tricks and can fly in the air?" J: "Yes, they were the ones who lifted Copperfield so he could float a little into the air, it took thousands of jinns to lift it. Whereas the girl you witnessed who cut it in the chest, was the female genie who appeared in the form of a human girl. He disappeared, then showed himself back without the slightest injury. " 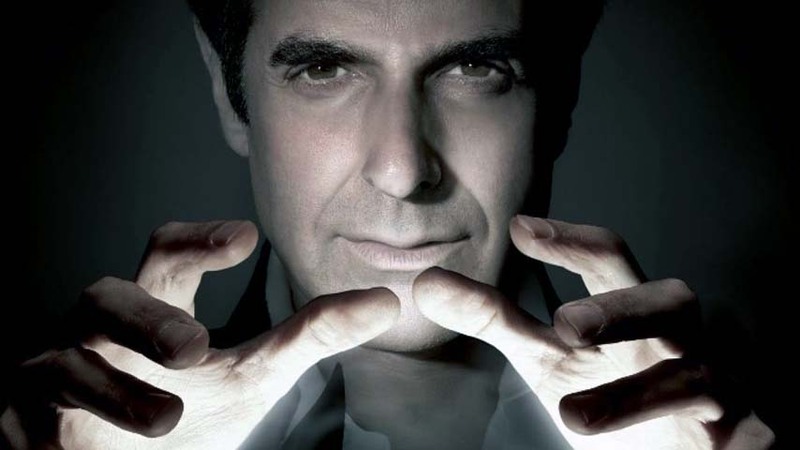 P: While handing out my personal document, which is a letter bearing strange letters, another agreement between genie and man, I asked him, "Is Copperfield sure to sign an agreement like this?" J: With surprise, he replied, "Where did you get this?" P: "A Muslim has copied it from a westerner. He said that this was an agreement between the Devil himself and a magician. " J: With a loud voice my best friend Jin said, "No! This is a lie. This is not a sign and approval of Satan. It is very difficult to ask Satan to be willing to agree like that with humans. At most, he told one of his followers to reveal himself as himself, then make a lie by saying, "I am a Devil". P: "Then what is the truth?" J: "This is an authentic agreement between a magician and four jinns whose signatures are clearly stated here, which is then strengthened by the Ifrit stamp." P: "What do you think about this?" J: "I often see stamps like this. My grandfather also has this kind of thing. " P: "What language is used in this agreement?" J: "I don't know, maybe the ancient Greek language." "However, believe me, that magicians like this will not die properly. If God extends our age, God willing, we can see the end of all these mysteries. " The collapse of assumptions about presenting spirits.Runtuhnya anggapan tentang menghadirkan arwah gentayangan. P: "Can Qarin (the human companion Jin) show themselves in human form, both in appearance and appearance?" J: "Actually no. Because, he is a genie. But easily, and because it is so long along with that person, that companion genie like that can be presented by someone, to appear in your form, imitate your voice, then claim to be your spirit coming from the world of barzakh to fulfill the call of the one who call him, and answer your questions. Even he can copy your writing. My dear Muslim mate told me that non-Muslims and demons really like Khamr (liquor), all kinds of khamr without exception. "It is not important whether he is a religion or not, what is important is what he did during his life. Come to me, a person who does not embrace any religion, who has never worshiped God, 'drank' enough, but is honest, and always helps the poor, and feeds animals, and people who always give love. He is definitely better than people who claim to embrace a particular religion ... "
"I will tell you something very important, all the talk that a genie said as a spirit coming from another world is a lie. Because lies do flow in the body of demons and evil genes as oxygen flows in the human body. If I am not a Muslim genie, surely I will not disclose this to you. Even demons have an extraordinary ability to instill confidence in the religious falsity of humanity with their "honesty". So that humanity has become a misperception that the most important purpose of life is only to love, the end is now that there are many free relationships that seem to be based on compassion, and some other patterns of understanding that look good, even though they are misleading. " This ebook does not entirely quote the translation from the Book of Hiwar Syahafiy Ma'a Jinni Muslim, but from the next conversation it can be concluded that anything that has been a myth of society namely the devil in the form of a child, pocong, gundrowo or even the spirit of a dead person is none other only the TYPES OF POWER the devil or the evil genie. They always try to instill that into the depths of man that there is no real grave. What is, after death the spirit can return to roam the earth, see relatives and "enjoy" the world for the second time. Therefore, it is not uncommon for us to see people possessed who confess the spirit of Si A and occupy my house. Which in fact is a genie who occupies a house or certain places and usually feels disturbed by the presence of humans in the region. And they use this method so that humans leave the place and leave by bowing to the behavior of genies like that. Even though humans should not be obedient to the instructions of the Jinn, especially with the command to offer food or anything in the form of offerings (offerings) which would certainly continue to plunge humans into the world of polytheism. Whatever the case may be, the spirit of the deceased man has faced the Divine and is responsible for all his actions in the world. Some jinns sometimes like to incarnate into animal forms as the most preferred are tigers, cats and even snakes. But it is not always visible that most people can see. Under certain conditions (and rarely) genies can manifest in the human realm in the form of these animals. And if there is a psychic who feels that he has seen Jinn in scary forms or in animal form, it is precisely the paranormal is under the control of the demonic magic to be seen as he wishes. Therefore, most religions are strongly opposed to paranormal sayings, because the majority of them are precisely under the control of Satan who seems to have supernatural powers and extraordinary. So with the trap of the "miracle" that many people are now trapped in the trap of Shetan and obey what the order of shaitan through the paranormal. Finally, I hope this ebook is useful, and keep holding on to God's commands, and do not underestimate His commandments which sometimes according to our reason spele. If we leave God, Satan will always be stronger than us.